Chinese New Year 2016 arrives, and the year of the monkey begins. Advanced Fertility Center of Texas knows that those born in the year of the monkey are said to be crafty, clever and charming. That’s spurred some couples in China to delay parenthood until the less-auspicious year of the sheep ends. The change in the Chinese zodiac from sheep to monkey, which happens on February 8, has helped hospitals in China boost maternity bookings by as much as 30 percent. The anticipated increase in birth rate this year is similar to the increase in pregnancy rates that Advanced Fertility Center of Texas witnesses with the process of IVF (In Vitro Fertilization), which helps couples overcome several infertility factors like endometriosis, male factor infertility and tubal disease. “Our method of freezing the embryos, preparing the uterus and placing the embryo back in another cycle has dramatically increased our pregnancy rates and decreased maternal complications as well,” states Dr. Michael Allon. IVF Freeze All Treatment is the process by which women’s ovaries are stimulated with medications to produce several eggs. This process takes about 10-14 days so that the follicles (eggs) can reach a mature size. The follicles are then retrieved with the aid of a transvaginal ultrasound and within four hours they are united with the partner’s sperm to produce embryos. The embryos are placed in culture for five days to produce a blastocyst and are then vitrified (frozen). The process of verification has revolutionized embryo storage and has led to an excellent survival of the embryos- greater than 96% once they are taken out for the process of embryo transfer. One of the many advantages of utilizing a frozen embryo transfer is that it eliminates exposure of the uterus to high estrogen levels, which can reach 10-20 times the normal cycle, and advance the endometrium to create a mismatch with the embryos. Our IVF Freeze All Treatment allows all the hormones to dissipate outside the body and use minimal preparation of the uterus for the process of embryo transfer. This can eliminate the risk of ovarian hyperstimulation syndrome, which occurs when the ovaries continue to enlarge and cause severe abdominal discomfort, fluid accumulation in the pelvis, and dehydration, which may require hospitalization. This process is particularly common in women with PCOS. We highly recommend using frozen embryo transfer to patients diagnosed with PCOS for this reason. Another advantage is that children born from frozen embryo transfers are about 150gm bigger than children born in the conventional fresh embryo transfer. Frozen embryo transfer allows us to accumulate embryos over two cycles, which is useful if the patient has poor quality embryos in the first cycle. With more embryos to choose from, we can transfer the best embryos. Several studies confirm that frozen embryo transfer has about 10-15% higher pregnancy rates. 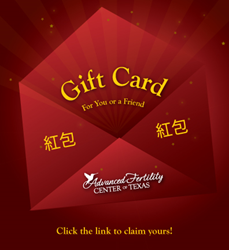 In celebrating the Chinese New Year, Advanced Fertility Center is excited to help couples grow into families by offering a red envelope gift. Register at http://infertilityanswers.com/news-events/red-envelope-gift-for-chinese-new-year/ and receive a red envelope that you or someone you know can use towards IVF treatment. The gift is valued at $2,000.00. Advanced Fertility Center of Texas has several fertility treatment centers located throughout the Houston metropolitan area, in The Woodlands, Memorial City and College Station, offering the most comprehensive, cutting-edge fertility services available. They assist couples and individuals in experiencing the joy of parenthood by providing the entire range of fertility services on-site, including artificial insemination, injectable gonadotropins, and in vitro fertilization treatment as well as treatment for endometriosis, polycystic ovary syndrome, and other gynecologic conditions.